I had the honor of hanging out with a great group of patriots, the Ft Lauderdale Tea Party. I was the keynote speaker at their 309th consecutive meeting. My message articulates why Conservatism is best for all Americans and why Liberalism is destructive. My presentation also includes me singing which enhances my message because music strikes a universal emotional chord. The audience at the meeting included the president of a high school Republican club. I asked why he chose Conservatism. He chucked and attributed it to his high IQ. There is hope for the future folks. The extremely faithful and fired-up patriot leaders of the group are Danita and Jack; new friends of my wife Mary and me. Jack informed me that a poll revealed that Jeb Bush topped his group's list of least favored presidential candidates for 2016. A gentleman bent my ear for quite a while, ranting about how he will stay home on election day if Jeb Bush is our candidate. He vowed never again to hold his nose and vote for a RINO, citing having voted for McCain and Romney. Remember, Obama was reelected in 2012 because four million Republicans chose not to vote. Some thought whats the point – Romney vs Obama, six of one, half a dozen of the other. Some Christians said they could not vote for a Mormon. I thought, “Great, so you sat at home and allowed a true devil to win!” Having said that, I do respect and appreciate that Conservatives are thinkers and are driven by character and principles. I held my nose and voted for Romney because I knew the alternative was much, much worse; giving the most America hating arrogant out-of-control president in U.S. History four more years to urinate on our Constitution; purposely lower our status on the world stage and correct what he erroneously perceives as America's injustices. Our president is obviously an anti-America-as-founded far left radical operative; an enemy from within. During the Cold War some feared the Communists would overtake us without firing a shot. Ladies and gentlemen, I give you Barack Hussein Obama. My faith in God keeps me upbeat and confident that we will overcome the evil seeking to destroy our great nation. God's Word instructs us not to grow weary in well-doing. As for Jeb Bush becoming our nominee, I am thumbs down on him because of his support for Common Core (big government overreaching control of education) and amnesty for illegals. However, if it comes down to Jeb Bush or another flaming RINO as our candidate, the Tea Party will be faced with a difficult dilemma. We've seen this movie before. The MSM will beat the public over the head 24/7 with their lie until the public is repeating it; opposing Hillary is sexist, white cops murder blacks, white privilege is a problem, Republicans are at war with women and so on. Hillary Clinton occupying the White House will in essence mean at least four more years of a Democrat regime believing themselves invincible, free to continue using the Constitution as toilet paper. We can not allow the deep-pocketed GOP establishment or mainstream media to select our presidential candidate. So, how do we avoid the great 2016 Tea Party dilemma, having to vote for a RINO? We must rally around a conservative candidate who probably will not walk on water (be perfect on every issue). I can support a non perfect conservative candidate as long as they are fearless and laser focused on stopping Obama's insane evil agenda. 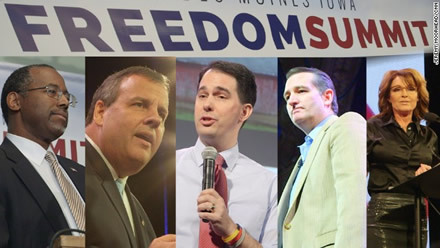 I am starting to hear patriots say they are “all in” for their favorite 2016 presidential candidate; Ted Cruz, Scott Walker, Dr Ben Carson and so on. Fine, I am cool with that. I am not ready to go “all in” for anyone at this stage. All I ask is that we unite and rally around the last conservative standing. Folks, I pray that our nation can recover and turn back the mess of 8 years under Obama, America's first king. The last thing America needs is Hillary, America's first queen.